Birdwatchers from near and far flock to Clare which has an international reputation for the numbers of rare species that pass through these parts. Expect excellent views of breeding seabirds such as kittiwakes, puffins, razorbills, fulmars and guillemots all along the cliffs of the west coast. Ballyvaughan Bay is good for wildfowl, waders, divers, ringed plover, oystercatcher and terns. The best place in Ireland to see large numbers of purple sandpipers, turnstones, sanderlings and ringed plover is at Lurgan Bay, south west of Quilty. Over forty-one species of birds have been recorded in nearby Poulnasherry Bay. It is a designated SPA, an important ornithological site and an important breeding area for Brent Geese. 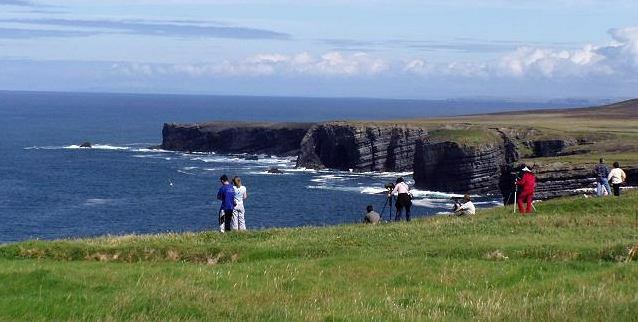 Loop Head is very popular with birdwatchers from all over the world. This popularity is due to the range of seabirds that breed here each summer (including Kittiwakes, Fulmars, Guillemots, Razorbills, Puffins and Gannets), and in particular due to the autumn passage of an amazing array of seabirds and waders. The best months are August through October, when West and NW winds blow many of the passing seabirds close to shore, so allowing excellent viewing. Seabirds regularly seen here in good numbers include Manx and Sooty Shearwaters, Storm and Leaches Petrels, and Great, Pomarine and Arctic Skuas. Sightings of Little Stints, Curlew and the American Buff-breasted Sandpiper have been made, and there are many other rare species seen from time to time from local viewing points. The best place for birdwatching in Clare are the Bridges of Ross on Loop Head Peninsula. The Keating family who do not only own the land around this scenic area also run a very nice B&B nearby, Anvil Farm, a favourite place to stay for birdwatchers from all over the world. Click here to find out more. 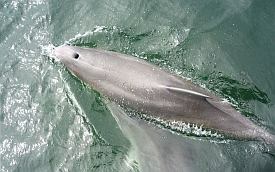 The Shannon estuary is the longest sheltered, naturally deep estuary in the country - a playground for a number of bottlenose dolphins. These can be observed from various places along the coast as on Dolphin watching tours which depart from the Kilrush Marina and from Carrigaholt harbour.